Pets can bring a lot of joy to ones life, but they can also be expensive to look after. Just like any other member of the family, the need food, shelter, and fun. While I can't speak for cat and dogs, as a long time owner of small creatures like guinea pigs and rabbits, I have a few tips on how to cut down on the costs. If you have a lawn, then you can feed your pets for free on grass, and you save money on not needing to buy a lawn mower. Make sure to move your pets around the lawn so that they do not eat away an entire patch down to the root. Grass from the river bank. If you do not have a lawn, then go outside to a riverbank or grassy area where you can pull up some of the grass (make sure it is allowed), or if you have neighbours that mow their lawn, see if they wouldn't mind lending you the cuttings (make sure you only leave the cuttings available for one day, as they begin to give off gasses which could be bad for your pets). Instead of buying lots of fresh fruit and vegetables from the supermarket, you could grow your own, or collect tree fall fruit from the garden or in the park. Recycle shredded paper by using it for pet bedding. Hay and wood shavings can be expensive, but you can use less if you combine it with shredded paper. We all need to shred our letters anyway, and this save it being wasted afterwards. Newspapers can line a hutch. Newspapers are the best way to line a hutch, and many can be picked up for free at the train station the the way to work. I pick up a wad every time I go. Small rodents and cavies need to gnaw on things to keep their teeth down, and it also stops them from getting bored. You could buy gnaw toys for them, but a much cheaper way is to put old planks of wood (from a broken fence, for example) or sticks and branches into their hutch for them to chew on. Flower pots make a good hidey-hole. 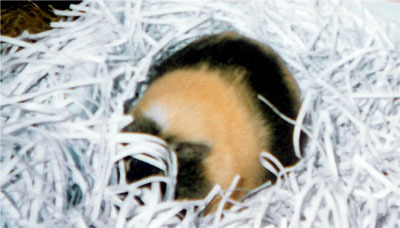 Small animals love to hide away. My guinea pigs love sitting inside flower pots or snuggling together under cardboard boxes.